Origin and Habitat: This species is endemic to Bolivia, where it occurs in the province of Florida . It has a very restricted range (extent of occurrence is 250 km2) and is known from two isolated locations and collection is a major threat for this species. The northern subpopulation is known from a single cliff, whereas the southern subpopulation occurs over a stretch of approximately 10 km of cliffs. Altitude range: Cleistocactus winteri grows at elevations of 1,300 to 1,400 metres above sea level. Habitat and Ecology: The species occurs on cliffs within forests, in seasonally dry inter-Andean valleys. The southern subpopulation is negatively affected by local collectors, who use them as ornamental plants. Description: Cleistocactus winteri, often labelled Hildewintera aureispina, is a branching columnar cactus of fairly rapid growth that resembles a very robust version of the popular peanut cactus (Lobivia chamaecereus). It forms soon tangled scrubs of long golden coloured drooping stems and produces vivid orange to salmon-pink flowers. They are repetitively and freely produced on mature plants from spring till frost and can last for several days. Stems: Cylindrical, spreading, arching, pendant, or trailing that can grow up to 1,5 metres long and 2.5-6 cm wide with many branches. Spines: About 50 bristly, flexible, straight, golden-yellow to brownish that literally cover the surface of the stems. The 20 or more, powerful central spines are 5 to 10 mm long. The 30 radiating spines are 4 to 10 mm long. Flowers: Funnel-shaped, tubular, upturned vivid orange to salmon-pink, 4 to 6 cm in length, 5 cm across and very showy. Scale on the tube orange. Outer tepals radiating and bent back, inner ones shorter end upright. Stamens and style exerted. Fruits: Barrel shaped, 7-10 mm long and wide, green to reddish-green. 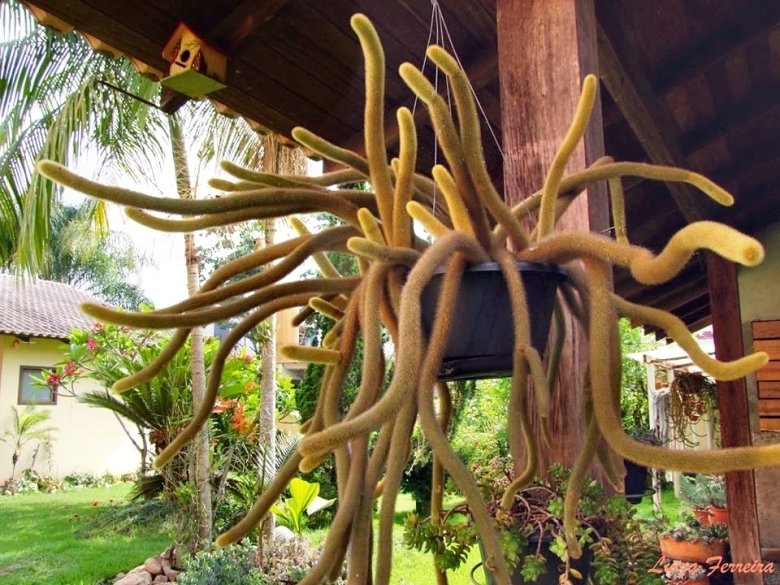 Remarks: Hildewintera hybrids: Hildewimtera aureispina (now renamed Cleistocactus winterii) is an old species that has been intensively hybridized with other cacti (especially Echinopsis and Lobivia sp. but also Matucana, Akersia, ecc) giving rise to some interesting intergeneric hybrid. Hildewintera hybrid develops really amazing flowers of different colours on the original pendulous "hildewintera" body and many of these hybrids have cultivar names. This plants form soon spectacular clumps with several flowers at a time and are quite a sight. They are often thicker, stronger, larger growing than Hildewintera aureispina and tend not to have the typical thin stemmed offsets. The offsets produced being more strongly attached to the main stems. 5)Lowry, M. 2013. Cleistocactus winteri. The IUCN Red List of Threatened Species. Version 2014.3. <www.iucnredlist.org>. Downloaded on 08 April 2015. 6) Navarro, G. 1996. "Catálago ecológico preliminar de las cactáceas de Bolivia." Lazaroa 17: 33–84. 7) Nee, M. 2004. "Magnoliidae, Hamamelidae y Caryophyllidae." 2: 1–209. In M. Nee Fl. Reg. Parque Nac. Amboró Bolivia. Editorial FAN, Santa Cruz. 8) Véliz Pérez, M. E. 2008. "Cactáceas Guatemala" 1–129. Univ. de San Carlos de Guatemala, Guatemala. Cultivation and Propagation: Cleistocactus winteri is of easy culture, which makes it a good cactus for beginners. It suited to hanging baskets as well as pots.